Tucked in the mountains, a few miles west of magnificent Lake Tahoe, is another body of water that just might be, with apologies to Mark Twain, the second fairest picture the whole earth affords. Called Fallen Leaf Lake, this picturesque alpine lake rivals its larger neighbor in beauty. In fact, if not for a fluke of nature, namely a small stretch of land that separates Fallen Leaf from Tahoe, the area could easily have been another Emerald Bay. Fallen Leaf Lake is located five miles west of Highway 89, immediately north of Camp Richardson on Lake Tahoe's southwest shore. A marked and paved road is located directly across the highway from the entrance to the U.S. Forest Service Visitors Center and Tallac Historic Site. The U.S. Forest also operates a developed camping area at the northeast end of Fallen Leaf Lake. The entrance to the 206-unit campground, which is open from May to October, is located about a quarter of a mile north of Fallen Leaf Lake Road, off Highway 89. The drive from the highway to the lake is pleasant, passing through large pine trees. About three miles from the turn-off, you travel by a lovely aspen grove and open meadow, both of which are spectacular in the fall, when the aspen leaves have turned gold. The road narrows as it reaches the east end of the lake and, after passing into a residential area, you catch your first glimpse of the lake. As you drive, you can see incredible scenery, including Cathedral Peak (the southern shoulder of Mount Tallac) rising over the lake, its 9,785-foot crown mirrored in the lake's crystal waters. I think it is the "mirror effect" of Fallen Leaf Lake that makes the view so remarkable. Rather than enclosing the lake, the reflection of the surrounding mountains seems to stretch into infinity and create a sense of being in a much larger place. While much of the lake is private property, you can continue to drive to the lake's west end where, in the summer months, Fallen Leaf Lodge offers accommodations and a marina. In the winter, the lodge is closed but you can park and enjoy the marvelous views. About a half mile from the end of the road (it comes to a dead end at the Stanford Sierra Resort, a private retreat), you can turn west on another narrow (all the roads around here are extremely narrow, so be careful while driving) paved road, lined by large log railings. This road leads to Lily Lake, a trailhead for hiking into the nearby Desolation Wilderness and an elegant waterfall (which, according to E.B. Scott's book "Saga of Lake Tahoe," is called Modjeska Falls after a famous Polish actress of the late 19th century who visited them). Frankly, even if Fallen Leaf Lake didn't exist, the waterfall would be worth a visit. Located just north of the road on Glen Alpine Creek, which feeds into Fallen Leaf Lake, the joyous, rolling waves of falling water are an impressive and unexpected sight. You can park off the road here and hike to the waterfall. From the top, the view of the rapidly cascading water as it falls down the lush canyon is worth noting. Across the creek, you can also see private homes—people fortunate enough to be able to look out on the waterfall any time they want. The road continues west, paralleling Glen Alpine Creek, for another mile or so to Lily Lake. Opposite the creek, parallel to the road, is a jumbled mountainside of loose boulders and stones. A concrete bridge marks the end of the drivable road. On the north side of the bridge, you can park and hike a short distance to Lily Lake, a small but photogenic lake literally cupped in the mountains. 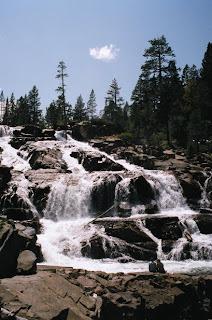 The main Glen Alpine Trail leads northwest from here, north of Lily Lake, into the Desolation Wilderness and Glen Alpine Springs, a former resort, located about a mile west after a pleasant walk through the trees. For more information about camping at Fallen Leaf Campground contact the National Forest Service, 877-444-6777 or go to www.fs.fed.us/r5/ltbmu/recreation/camping/flcamp.shtml. It’s easy to understand why Cathedral Gorge was made into one of Nevada’s first state parks in the 1930s. With its tall, deeply grooved, tan-brown, clay spires rising high above a narrow valley, Cathedral Gorge is something truly unique. 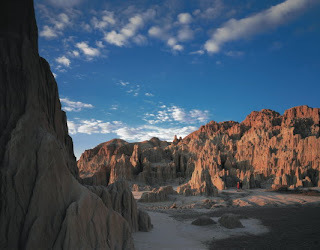 Cathedral Gorge is a place with great texture, beauty and mystery. Deep, shadowy crevices in the craggy cliff walls hint at hidden, dark passageways that lead into the unknown. As you stand admiring the Gorge’s evocative formations, you can’t help but be reminded of the fact that Nevada contains some pretty amazing terrain and landscapes. Cathedral Gorge is located in remote Eastern Nevada, a few miles from the small ranching and farming community of Panaca. To understand the forces that created this natural wonder, you’ve got to go back more than a million years, to a time when much of this part of the state was underwater. Natural streams flowed into a large inland lake that covered the entire valley where the gorge is located today. Those streams also brought silt and clay that, over time, eventually filled the lake. Flash-forward a few hundred thousand years—the lake has dried up and left behind a thick, clay lake bed. Wind and rain erode the clay, shaping it into the marvelous shapes found in the gorge today. In the late 19th and early 20th centuries, white settlers established small farms in the region and discovered the unusual formations at Cathedral Gorge, which was originally known as Panaca Gulch. Later, the gorge’s name was changed to Cathedral Gulch, because of its gothic looking clay spires, and eventually to Cathedral Gorge. After being designated a state park, the Civilian Conservation Corps, a federal work program that helped employ thousands of Americans during the Great Depression, helped develop the park for use by the public. Today, a handful of the structures and improvements built by the CCC crews can still be found in the park, including an old stone water tower and the wooden canopy that covers the main picnic area. The drive into the gorge doesn’t really prepare you for what you find there. After turning off from U.S. 93, you enter a small valley. Along the north side, you first spot the gorge’s dusty, brown clay walls. A bit farther, the walls grow steeper and more deeply carved. Then, you enter a wide valley surrounded by these immense clay walls and stone alone pillars and columns, each more fantastic than its neighbor. The formations here almost seem organic in appearance. The elements haven’t so much cut or gouged the clay as they have seemingly molded it into smooth surfaces with rounded edges. It all seems more like it has been flowed into place rather than carved or chiseled. The gorge contains several interesting self-guided hikes, which are marked. Two trails lead from the park and picnic area at the end of the paved entrance road to places called Moon Cave and Canyon Cave. While both are not really caves but rather, narrow passages that wind through the dramatic clay walls. A one-mile trail leads into the center of the main section of clay formations. Back in there, far from the parking lot and picnic tables, and deep inside the cool clay, you feel like you’ve been transported to another planet. At the end of the trail, you can climb a set of wooden steps that lead to the northern entrance to the park and a covered observation area known as the Miller’s Point Overlook. From the overlook, you can see almost the entire valley and admire the acres of marvelous clay sculptures. An attractive visitor center at Cathedral Gorge provides information about all of the state parks in Eastern Nevada. The center is a pleasing marriage of modern design and natural materials such as wood, brick and stone that allows the building to blend into its surroundings. The visitor center also has a small theater that regularly shows videos describing Cathedral Gorge and the five other state parks in the region. Inside the center, you’ll also find an information desk manned by park staff and displays containing historic artifacts found at Cathedral Gorge, including a large bison skull. There’s an interesting story behind the skull. In 1975, a family visiting the park spotted bones in a clay wash. Not realizing it was illegal to remove historic artifacts, they picked up the bones and took them home. The bones’ existence remained unknown until 1993, when a family member contacted the Nevada State Museum to return them. The bones, believed to have been from a two-year-old female bison, have been dated to about 1,200 A.D., and are among the oldest found in the state. Another unusual item in the visitor center is a weathered paper program for a religious passion play. Like the bison bones, the booklet was discovered buried in the gorge’s mud and date to the early 20th century, when Cathedral Gorge served as the backdrop for annual, locally produced religious plays. It turns out that the actors would transform the main part of the gorge into a stage, using the clay spires and formations as their sets. Cathedral Gorge State Park is open throughout the year. The park has 16 developed campsites with shaded picnic tables, RV dump station, toilets, and showers that are open during the summer and fall. Best time of year to visit is in the spring, particularly following a wet March or April, when wildflowers will bloom throughout the gorge. For more information about Cathedral Gorge State Park, call 775-687-4370. 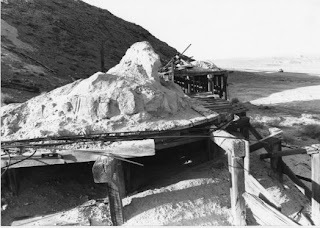 Mining in central Nevada didn’t begin in Tonopah in 1900. While that particular silver strike was certainly one of the state’s biggest mining discoveries, prospectors were actually working in the region much earlier. In fact, there’s a place not far from Tonopah where mining began about 40 years earlier. Known as Silver Peak, miners from the Austin area discovered gold and silver there in 1863. Silver Peak is located about three hours south of Fallon via U.S. Highway 95, then 21 miles south on State Route 265 (at a point about 30 miles west of Tonopah). Within two years of the initial discovery, a 10-stamp mill was erected, followed by the construction of a larger, 20-stamp mill constructed in 1867, and a town developed under the name, Silver Peak. The mill was shut down in 1870 and the mines were sporadically worked over the next 30 years. In 1906, the Pittsburg Silver Peak Gold Mining Company reopened the area mines and built the Silver Peak Railroad to carry ore from a large mill at Blair (a mining camp located about three miles north) to the Tonopah and Goldfield Railroad line. Silver Peak's fortunes, however, were more down than up, and by 1913, the town lost its post office to the thriving camp of nearby Blair. The town experienced another mining boom in the mid-1920s (it got the post office back in 1916, after Blair went bust), which produced more than $8.5 million in ore before cresting. A potentially fatal blow was struck in 1948, when most of the town burned. A modern town began to rise from those ashes in the 1960s, with the development of large scale lithium mining in the adjacent Clayton Valley. Turning off from Highway 95, you face a long stretch of open road bordered by the Silver Peak Range on the right and the Weepah Hills to the left. In the distance, you can see the snow-capped Montezuma Range. The air is clear and crisp—one of those days that you feel you could see all the way to Las Vegas if the mountains didn’t get in the way. About ten miles from the junction with Highway 95, the surrounding ridges take on a darker appearance, indicating the area's volcanic history. As if to verify that fact, the road passes right next to a large black collapsed cinder cone, with two additional cinder mountains visible in the distance. From here, you can also see the expanse of Clayton Valley, including the massive lithium mining operations. Just north of Silver Peak, you can find perhaps the best evidence of the older Silver Peak. Here, on both sides of the road, you can see the dilapidated remains of a few houses and stone buildings as well as the skeletal frame of a cyanide operation. Look closely and you might find the remains of an old buckboard wagon, sans wheels, hidden in the sagebrush near one of the structures. Passing through the center of the town, you can still see that some of the newer structures appear built upon the foundations and walls of older ones. Perhaps the most impressive ruins in Silver Peak are the large stone walls of a large mill located on the side of a hill that rises immediately east of the center of town. The ruins date to the 1860s. Surrounding the ruins is apparently the local junkyard, containing some older wooden shacks and buildings that appear to have been moved there from other locations.